With superb dancing and powerhouse vocals, the Maine State Music Theatre transports the audience to the era of disco balls and the infectious vibe of the ’70s. Dig out your platform shoes, short shorts, polyester suits and Bee Gees records. Maine State Music Theatre is boogying through its 60th anniversary season with a rad rendition of “Saturday Night Fever” that had the audience feeling like dancing opening night. The production captures the disco vibe of the late 1970s with precision choreography from director Mark Martino and funkadelic costuming from Michael Bottari and Ronald Case. It’s definitely a blast from the past as the cast and ensemble strut and shake to such iconic songs as “Stayin’ Alive” and “You Should be Dancing,” performed with ’70s swagger by musical director Jason Wetzel and his stellar eight-piece orchestra. 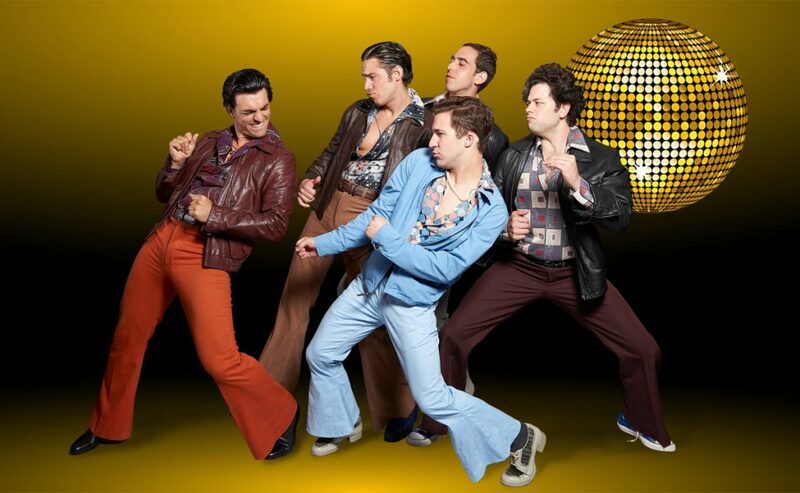 “Saturday Night Fever,” the musical, normally clocks in around 2 hours, 40 minutes, but Martino has pared it down to approximately 2½ hours, with intermission. The result is a more streamlined production that delivers the energy of disco fever, while touching on the underlying uncertainty and economic instability of our country in the aftermath of the Vietnam War. The plaintive wail of a lone guitar in the “Prologue” nicely sets the tone for the moving aspects of the story and score, interspersed between the fun-loving disco songs and electric dance numbers. Jacob Tischler steps into the “disco king” shoes of Tony Manero, originated by John Travolta in the 1977 film version. Tony and his friends Joey (Anthony J. Gasbarre III), Double J (Casey Shane), Gus (Nic Casaula) and Bobby C (Drew Carr) live for the weekend, when they can dance at the disco and escape their dead-end jobs. Carr and Christina Carlucci standout as Bobby C and his girlfriend Pauline, joining Tischler and Matteo for a gripping performance of “Stuck.” Mariah MacFarlane is also nicely highlighted as Annette on “If I Can’t Have You,” passionately lamenting her character’s unrequited love for Tony. Of course, what would “Saturday Night Fever” be without a little self-deprecating humor? Michael Peter Deeb and agile performance interns Elisabeth Christie, Stevie Ann Mack, Lauren McDonald and Melaina Corey Rairamo are an absolute riot as Pete’s jazz class, going above and beyond to look like no-talent dancers.